Crew on ship visiting Wellington. Photo: Supplied. Every year, the United Nations’ International Mariners Organisation (IMO) observes 25 June as the Day of the Seafarer. 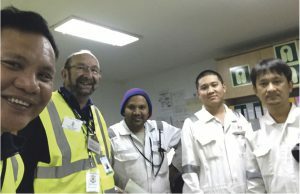 The goal is to highlight just how important seafarers are to everyone as they transport all over the world the items, commodities and components vital to our daily lives. Social justice is an important concern as 95 per cent of world trade is through shipping. The Apostleship of the Sea New Zealand (AOS NZ) were able to offer financial support recently to the family of the Filipino seafarer who was killed at Port Chalmers by an exploding gas cylinder on a summer cruise ship. Our National Secretary, Rose Celeste, negotiated with the port chaplain, Fr John Mission, in Cebu – a province of the Philippines – as how best to help. With agreement of all members nationally we committed $NZ1000 to help and best support the family. We are constantly reminded of how important this work is – the care to seafarers, fishers and their families. In March this year our Stella Maris Regional Co-ordinator, Sr Mary Leahy in Sydney, notified us of a Kiribati seaman who had an accident on a ship heading to Wellington. He lost part of his thumb and needed urgent medical care. The team at Wellington Seafaring Centre visited him at Hutt Hospital Plastics Unit and supported him right through his long post-op recovery at a motel. Your support helped do this. Last February Rob and Jess Armstrong, our managers in Lyttelton, were notified by ISWAN (International Seafarers Welfare & Assistance Network) that a ship was heading towards New Zealand with wages unpaid. They contacted the Maritime Union NZ and Maritime NZ impounded the ship until the case was resolved before sailing. The Government has just given the church interdenominational group, which operates as the Seafarers Welfare Board NZ, a lot more power to provide welfare and advocacy for seafarers. From now on we will be more resourced to do this work and we can now better show the Church’s commitment to social justice. Bad treatment of seafarers has bad consequences for us all as over 90 per cent of all we consume comes by ship. Yet no other group of workers on the planet is more underpaid, more physically and sexually abused and more enslaved than seafarers. We have work to do. Remember seafarers on 25th June, – the UN International Seafarers’ Day. Fr Jeff Drane sm is National Director of AOS NZ. He is based in Wellington.